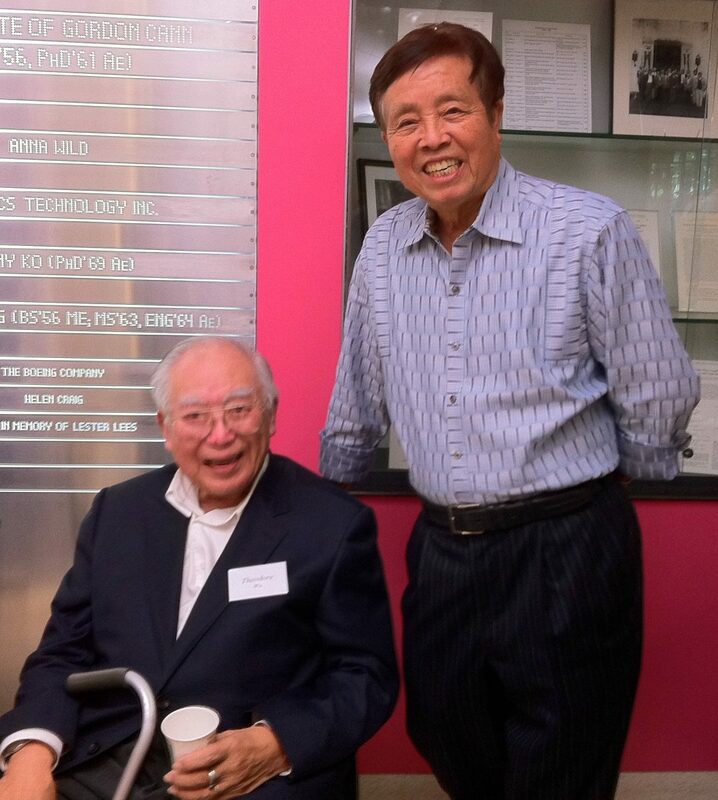 When Li-San Hwang (PhD ’65) arrived to Caltech for doctoral study in 1962, he found a mentor and a friend in Theodore Wu (PhD ’52), now an emeritus professor of engineering science. Just weeks after they met, Hwang invited Wu to attend his wedding and walk his fiancée down the aisle. Anne had just arrived from Taiwan to enroll at UCLA, and the couple’s family and friends could not fly to the United States for the ceremony. Over the passing decades, the Hwangs have been impressed with Theodore Wu’s scientific research, which has spanned fields such as hydrodynamics and bioengineering, including studies of bird flight and fish locomotion. They also aspired to emulate Wu’s willingness to help others. Li-San and Anne Hwang recently made three gifts to Caltech totaling $3 million: a current-use fund for the Division of Engineering and Applied Science and two endowed funds named in honor of Theodore Wu. The endowments support one professor and multiple graduate students who work, as Li-San Hwang did for 50 years, to minimize society’s collective impact on the environment. In 1967, two years after he earned his doctorate from Caltech, Li-San Hwang joined Tetra Tech, a then-new company that provides engineering services related to waterways, harbors, and coastal areas. Twenty years later, he became CEO. Hwang directed the company’s focus toward water pollution treatment and hazardous waste management, and Tetra Tech went on to become one of the country’s top consulting and engineering firms. With their gift to endow the Theodore Y. Wu Professorship and the Theodore Y. Wu Fellowship at Caltech, the Hwangs continue to champion science- and engineering-based sustainability solutions. Their support for the professorship was augmented by the Resnick Sustainability Institute at Caltech, which fosters advances in energy science and technology and provided an additional $1.5 million from the Lynda and Stewart Resnick Matching Program. Caltech scientist Tapio Schneider, the current Theodore Y. Wu Professor of Environmental Science and Engineering, and senior research scientist at the Jet Propulsion Laboratory, combines computer modeling with space-based observations to create new models of Earth’s atmosphere. His goal is to forecast, more accurately, the trajectory of the earth’s changing climate to inform plans for infrastructure (e.g., stormwater management). A named professorial chair is the highest recognition Caltech bestows on its faculty. Endowed professorial chairs are among the top fundraising priorities for Break Through: The Caltech Campaign, which aims to bolster Caltech’s role as a source of transformative discovery for the world. The Hwangs have made several other contributions to Caltech, including a scholarship named for Vito Vanoni (BS ’26, MS ’32, PhD ’40), a professor of hydraulics at the Institute from 1942 to 1974.